Harlequin Football Club (Harlequins F.C) had a gentleman’s agreement with the RFU to use their new football ground even before it was built in 1909. 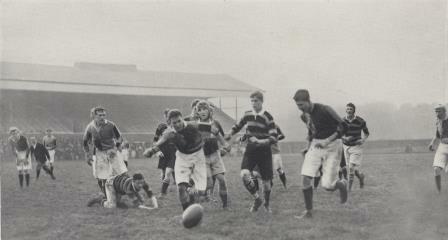 The first game at Twickenham was contested between Harlequins and Richmond, two local rivals, on the 2nd October 1909. Conditions in which most rugby matches are played in today contrast greatly from the conditions in the first game at Twickenham. The grass was overgrown and drenched from a continuous downpour over several days. Nevertheless, this biannual fixture meant a lot to both clubs and fans, attracting around 2,000 spectators on the day. Harlequins were victorious in this game with a margin of four points, winning 14 points to 10 over Richmond. Adrian Stoop, one of the most important players in Harlequin history, played in the match. Later he would be immortalised by the naming of the Harlequins’ current stadium (The Twickenham Stoop). Capped 16 times for England, scoring 6 points, he was considered influential in the game of rugby as he helped develop the modern, creative style of play for backs. He also captained the national side twice. Stoop had a huge effect on Harlequins, but he is also thought to have almost joined Blackheath, a bigger club at the time, and you cannot help asking yourself the question where Harlequins would be now had he joined Blackheath? Another of the most famous players for Harlequins in the match was Ronald Poulton-Palmer, who tragically died in the First World War when he was shot by a German Sniper in Belgium in May 1915. He, like Stoop, was considered an influential figure in the game because of his unpredictability in attack with inspired attacking moves, famously scoring against South Africa after starting an move from almost his own try line. He was capped 17 times for England between 1909 and 1914, scoring 28 points. 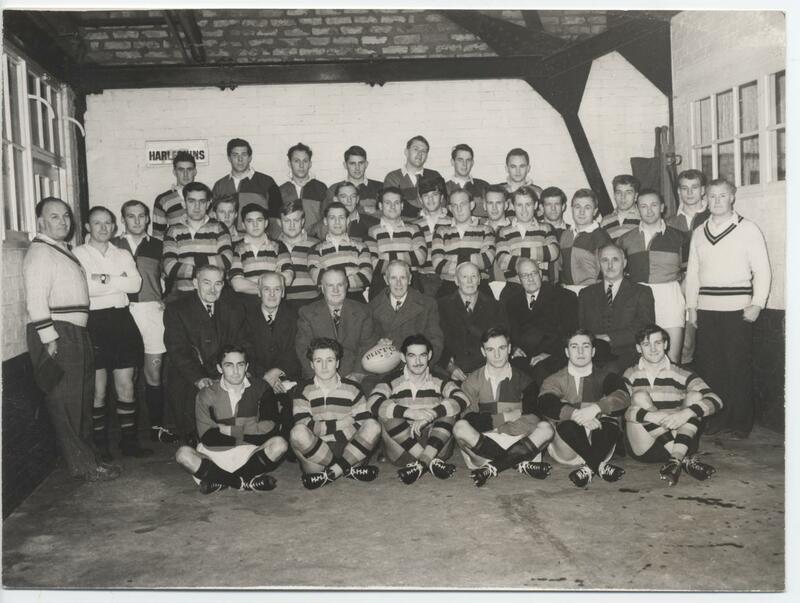 In 1959 Harlequins and Richmond played a ‘Jubilee Match’ to celebrate 50 years since the first game at Twickenham. Several survivors of the 1909 contest are sat on the second row. About the Author – Sam Derbyshire is a Harlequins fan and Year 11 student from Orleans Park School. He completed a period of work experience with the museum in July 2015. This entry was posted in Clubs, Twickenham. Bookmark the permalink.